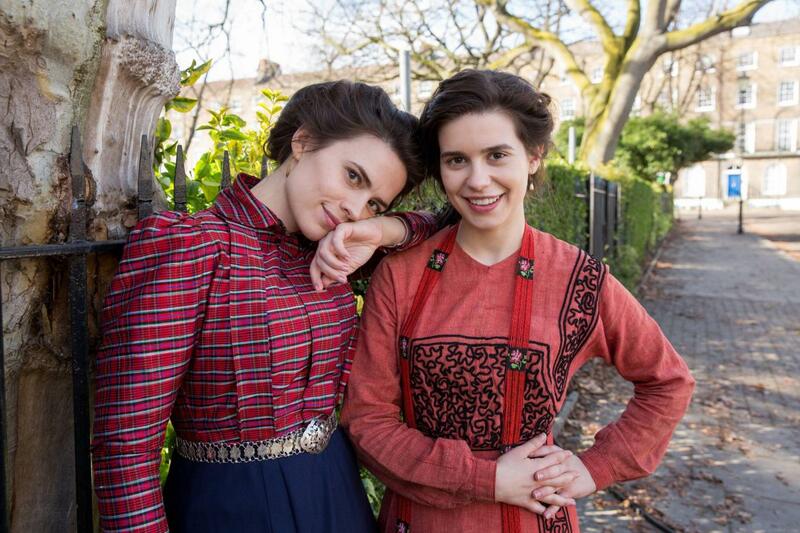 Two of literature’s favourite feminist sisters make their small screen debut on Sunday in Howards End – adapted from the EM Forster novel into a four-part series for the BBC. The Edwardian, middle-class Schlegel sisters, Margaret and Helen, sit at the heart of the novel, between the upper class Wilcoxes and the struggling Basts, in a story that tries to reconcile the three families in a hopeful vision for the future. The Schlegels are said to be based on the Bloomsbury group’s Vanessa and Virginia Stephen. Islington was able to provide the contrasting locations of the Schlegels’ home in Myddelton Square and the Basts’ home in the Peabody Clerkenwell Estate. For Myddleton Square residents, it was a big ask, with no less than three quarters of the square dressed as though it was 1905, with horses, carriages and period cars roaming about, and two blocks of shooting needed to capture both summer and winter scenes. Assistant Location Manager Jenni Lewis explains how the square came to play this key role in creating the world of Howard’s End. She says, “The Schlegel sisters’ London home is teetering on the verge of demolition for fashionable new mansion block flats. It was important to find a house on a square that could properly convey a much loved home of the period, nestled into the capital’s ever expanding and changing character. It also had to represent the modern, forward-thinking and socially minded sisters. “We looked at many period squares across London and Myddelton Square was eventually chosen based on its good looks and the feasibility of pulling off not one, but the two separate blocks of shooting required to represent both summer and winter. “We needed an accommodating film office and local council, who could a discuss a myriad of requests from street furniture removal and gate access, to road closures and snow and rain effects, while also understanding the ambitious vision we were setting out to achieve. “The real challenge with period filming is bringing the location back to its original state and we worked hard to achieve this. “It included removing modern features like bike racks, parking signs and road markings. For residents it meant modern window dressing like plant boxes, window decals or satellite dishes. Many people assume that the work is done in the editing process, but actually most of what you will see in Howards End is achieved on the set. “With the right amount of time and planning, consultation and discussion we were able to turn almost two thirds of Myddelton Square into a fully dressed Edwardian Square. “Working with the Myddelton Residents Association, church and film office we kept residents informed well in advance via hand delivered letters of our plans. “After our first letter we arranged a drop-in consultation session at the local church to discuss the ramifications of closing and restricting access to such a large section of the square on two separate occasions, and what that would mean for residents. “Any concerns were addressed at this stage and taken into consideration when we were planning. For example a resident who was in the road closure area was expecting a new child around the time of filming, so we made sure all our crew was aware of access requirements. “All in all, while no filming of this scale is fully without hiccups, both shoots were largely successful, and most residents seemed to enjoy watching our exterior scenes being created. “Having your neighbourhood transformed into a living, breathing time capsule can be a fascinating experience and I’d like to believe that most residents enjoyed it. “From our point of view as filmmakers, it was important to be clear and up front about what we hoped to achieve, to deliver on our word and to return the location to its former condition. FilmFixer manages the film office service for Islington, along with other boroughs that welcomed the production including Camden and Lambeth. FilmFixer director Karen Everett says, “As the press photos show, this beautiful Georgian square is an ideal setting for the period miniseries. “Working closely with residents, the production was able to create a lively streetscape, with horses and carriages and period cars. “Most of the filming was in March this year with around 45 cast and crew. “There was quite a lot of work involved. Not only did the modern street signs have to be disguised, but the children’s playground in the square’s gardens had be concealed with high trees in pots. And extra box hedging was brought in. Other Islington shots depict the Vine Street Bridge on Farringdon Road and St James’s Church Clerkenwell. Along the Albert Embankment in Lambeth, three scenes were filmed, as the key characters walk along with the Houses of Parliament in the background. Karen Everett continues, “In Camden in May this year, the production dressed Chancery Lane for scenes with the characters walking in and out of local buildings including Kings College Campus and the Knights Templar pub.